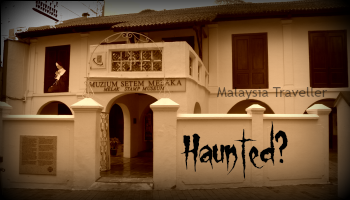 Stamp Museum Melaka - Nice cosy house - Haunted too! 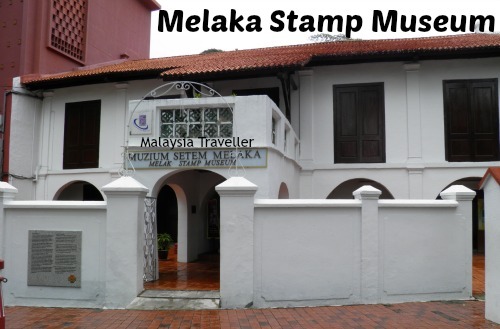 Stamp Museum Melaka occupies a nice cosy Dutch-era house with a ghostly past. An article in The Straits Times in November 1953 by Sheila Prentice titled The Hantu of No. 7 Fort Road records how this house, among the oldest in Malacca, was built about the same time as the Stadthuys, although the foundations are even earlier, probably dating from the Portuguese occupation (1511 - 1641). It is known that next door to house No. 7 was a convent where Bastion House (now the Malay & Islamic World Museum) presently stands. A Portuguese nun from the convent became involved with a soldier, also Portuguese. The story goes that as punishment for her illicit affair, the nun was condemned to death by being bricked-up alive in the outbuildings in the garden behind the house, perhaps where their clandestine meetings took place. The ghost of the nun is said to haunt the house. Her ghost has been seen multiple times over the four centuries since her presumed death, still wearing her brown nun’s habit and followed by her lover wearing a soldier’s uniform of the period. The residents of the house in 1953 (when Ms. Prentice wrote her article) knew the ghost well and the children living there described her as Mummy’s friend. She would be seen on the porch verandah where the sea wall used to be before land reclamation. 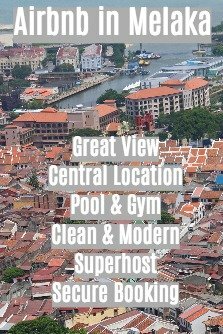 Prentice goes on to describe the antiquity of the building with massive hand-fashioned beams, sloping floors and crooked doorways and Chinese porcelain grilles which may pre-date the property as the Chinese lived in Malacca even before the Portuguese arrived. 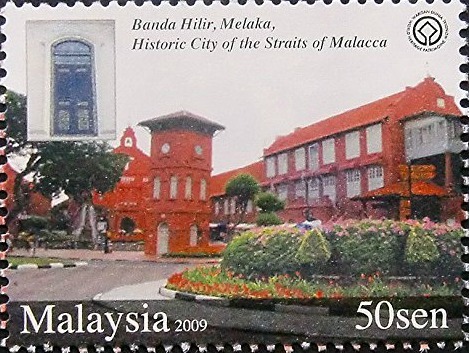 Shortly after the article was written the house was converted into the Malacca State Museum which opened in 1954 and continued until it was shifted to the Stadthuys in 1982. In was then used for various other purposes before becoming the Stamp Museum in 2007. What happened to the ghost? There do not appear to be any recent sightings but perhaps she only comes out after the museum is closed up for the night. The museum should consider offering ‘Night in the Stamp Museum’ experiences as a way of earning extra revenue! Earliest known letter from Melaka (a copy only, not the original). Rare stamps of Pahang (bisects). Posters of the Penny Black (world’s first postage stamp). 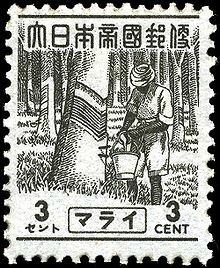 Stamps from the Japanese occupation. Postman uniforms through the decades. North Borneo and Straits Settlements issues. 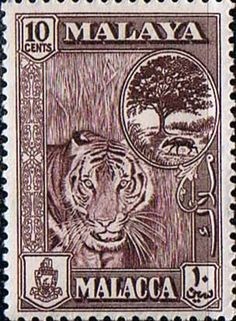 One interesting issue is the 1946 Malayan Union stamp. 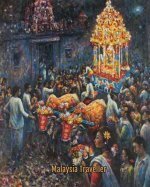 That year the British introduced the Malayan Union as a new entity to govern Malaya but it was opposed by the majority Malays and had to be abandoned, to be replaced by the Federation of Malaya. 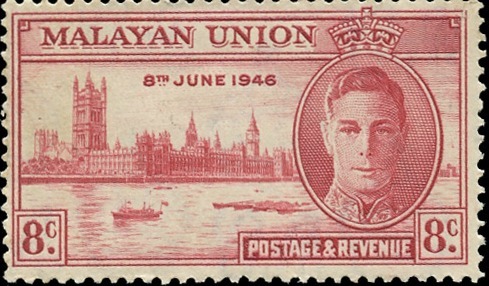 The Malayan Union stamps were printed but never issued and were sent to the KL Municipal Incinerator for destruction. However some of the stamps were stolen by an official at the incinerator and were sold to the stamp trade. Most were charred or dirty and only a few fine examples survived, hence they are scarce. This stamp sells for around £200 in auction. There is a shop in the museum selling stamps, first day covers, banknotes and souvenirs. You have to remove your shoes to go upstairs. Open Daily 9am - 5:30pm.